Nocturnal. Milk Snakes range from 2 to 4 feet. They have a long and slender shape which helps them to move through grass without making much noise. The Milk Snake’s body is covered with scales that have a color that is similar to that of the venomous Northern Copperhead Snake but are non-venomous. They are light brown or gray in color with reddish blotches which are larger on their backs and smaller on their sides. The pattern on their underside is white and black. 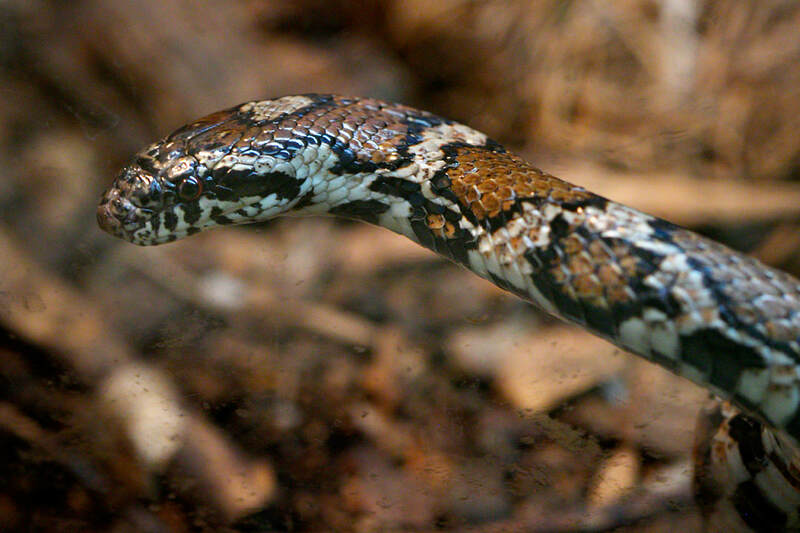 Snakes smell by using their tongues. They kill their prey by strangulation. Their teeth point toward the back of their mouth, which helps them to keep their prey, which are swallowed whole, moving in the right direction. Milk snakes may shake their tails rapidly, with the sound often mimicking that of a rattlesnake. Milk Snakes are found under logs and rocks on hillsides, wetlands, fields and river bottoms. During the winter months, snakes stay in dens where they go through a hibernation period as their body temperatures drop and heart rates and breathing slow down. Milk Snakes are found throughout the eastern United States, into southern Canada, and also south into Mexico and Central America. Rodents, reptiles including venomous snakes, amphibians, birds, invertebrates and eggs.. Unknown in the wild; 20 years under human care. Female Milk Snakes lay about 10 eggs at a time in June or July. The female leaves the nest shortly after laying the eggs and provides no care for the developing eggs or the young snakes. The eggs have thick, leathery shells and are buried under dirt or leaves. They hatch in late summer. Presently secure in CT, though in peril in southern parts of range. The Eastern Milk Snake is facing significant pressure due to pet trade collection in some areas and as a result captive breeding programs have begun. 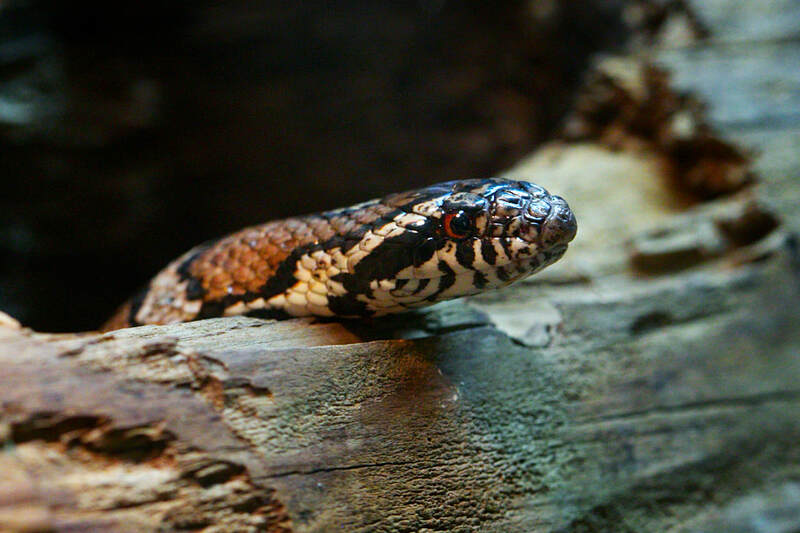 ​Next time you visit our New England Farmyard, take a look into the Reptiles of Connecticut building to see our beautiful Eastern Milk Snake. The exhibit was designed to resemble the outside of a home, and here in Connecticut you may be lucky to observe one of these harmless snakes in your own yard. Sadly, every year a number of Eastern Milk Snakes are mistaken for Northern Copperheads and killed. There are many myths about snakes, but even if they do not happen to be your favorite, it is true that they are more afraid of you than you are of them. Eastern Milk Snakes also serve as Animal Ambassadors in our Education Department, and you can request that one join you at your Zoo birthday party.